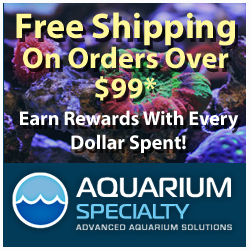 You are at:Home»Aquarium Livestock»Angels and Acros Everywhere! I don’t know what’s more impressive, the gorgeous array of corals or the plethora of unique fish that fill this tank. Actually, I’ll go ahead and say the fish are more impressive, and you’ll know why after reading the stock list below. The video above from “personatus2010” (quite the fitting name) shows a stunning tank, jam packed with plenty of rare and pricey fish, specifically some very uncommon butterfly fish and angelfish. The stock list includes a trio of Bandit angelfish (Holacanthus arcuatus), a couple of Goldflake angels (Apolemichthys xanthopunctatus), a Tinker’s butterfly (Chaetodon tinkeri), a Marquesas butterfly fish (C. declivis), a wrought iron butterfly (C. daedalma), and finally an über rare juvenile Masked angelfish (Genicanthus personatus). The last on the list is one of particular interest to rare fish lovers as it is endemic to Hawaii and fetches around $10000 per. Please excuse the drool all over the keyboard. It’s not often we get to see a tank with that many gorgeous fish. And it’s even rarer to see one with a G. personatus angel. Besides the rare angels and butterflies, if you are interested, there are a few more common angelfish like the multi-colored angel, flame angel, and what looks to be a Potter’s angel.